Lara Croft has come a long way indeed from her origins in the video games of the 1990s. With a movie franchise and brand-new series of video games under her belt, she's just as popular as ever. Join her for a treasure hunt in this online slot from Microgaming, and you might soon be able to afford your own mansion and butler, too. It's a fairly straightforward slot, as we'll see, but that doesn't mean you can't still discover the value of the ancient relics on your adventures with Lara. There are a few bonus features that'll help you reach for the fabled jackpot of 7,500 coins, and you can get spinning for as little as 0.05 coins. When the impeccably spoken, twin-pistol-toting archaeologist exploded onto the PlayStation back in the 90s, she took the world by storm. One of the first, and possibly most iconic, female characters in gaming, Lara Croft has become something of a legend in her own right. 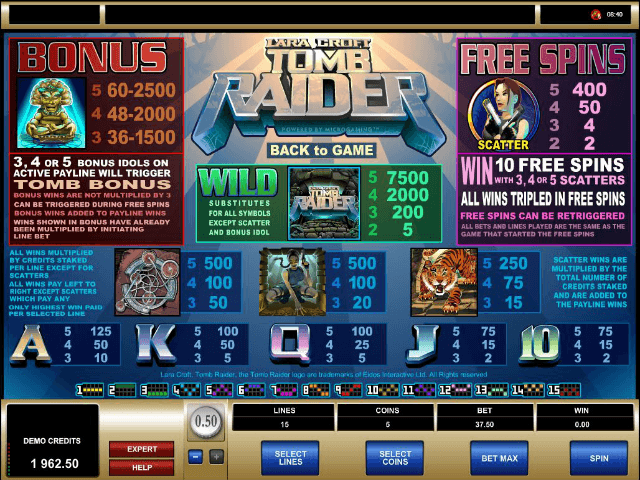 Software provider Microgaming has kept things simple but high quality with this Tomb Raider slot. The symbols are all themed in some way, and the images of Lara are true to her original look in the early days. There are no animations, but the music is a nice touch and sets the mood well. This online slot features 15 paylines spread over five reels. It might not seem a lot compared to other slots, but it does make it a good game for beginners starting to get to grips with slots, or if you're looking for a quick and simple game. There's a mix of standard letter symbols, and more Tomb Raider-themed ones, such as tigers and archaeological relics. For a standard win, try to match up the icons of Lara crouching with her pistol drawn, the tiger, and the mysterious puzzle. These pay the highest for normal spins. You can bet anything from 0.05 right up to 375 coins, so you've got plenty of choice depending on how flush you feel. There are two bonus modes in Tomb Raider. The first is the free spin mode, which you can activate if you line up three of the symbols of Lara holding both her famous pistols. You'll get ten free spins and any wins are multiplied by three as well, so you can net some decent payouts this way. If you manage to get another three Lara scatters matched, then you'll also refresh your free spins. The Tomb Bonus is essentially a pick game. You can get this going by matching up either three, four or five of the idol symbols. This'll change the screen to show you a number of idols you can choose from (the exact number depends on how many you got on the paylines). Each one is worth a cash prize. Overall this is a fairly simple slot, and perhaps more could have been made of the theme, but it's a solid spin and fun nonetheless. If you like Tomb Raider - You'll like these slots too!